This class extends the class %RegisteredObject. Equivalently, this class inherits from %RegisteredObject. %RegisteredObject is the superclass of this class, or this class is a subclass of %RegisteredObject. An InterSystems IRIS class can have multiple superclasses, as this chapter later discusses. The superclass(es) of a class determine how the class can be used. This class defines one method: MyMethod(), which returns a value of type %String. This class refers to several system classes provided by InterSystems IRIS. These classes are %RegisteredObject (whose full name is %Library.RegisteredObject), %String (%Library.String), and %Numeric (%Library.Numeric). %RegisteredObject is a key class in InterSystems IRIS, because it defines the object interface. It provides the methods you use to create and work with object instances. %String and %Numeric are data type classes. As a consequence, the corresponding properties hold literal values (rather than other kinds of values). You can use InterSystems IRIS classes as superclasses for your classes. You can use InterSystems IRIS classes as values of properties, values of arguments to methods, values returned by methods, and so on. Some InterSystems IRIS classes simply provide specific APIs. You typically do not use these classes in either of the preceding ways. Instead you write code that calls methods of the API. %RegisteredObject  This class represents the object interface in its most generic form. %Persistent  This class represents a persistent object. In addition to providing the object interface, this class provides methods for saving objects to the database and reading objects from the database. %SerialObject  This class represents an object that can be embedded in (serialized within) another object. Subclasses of any of the preceding classes. None  It is not necessary to specify a superclass when you create a class. Later chapters of this book discuss these categories of classes. The phrase object class refers to any subclass of %RegisteredObject. With an object class, you can create an instance of the class, specify properties of the instance, and invoke methods of the instance. A later chapter describes these tasks (and provides information that applies to all object classes). The generic term object refers to an instance of an object class. Transient object classes or registered object classes are subclasses of %RegisteredObject but not of %Persistent or %SerialObject (see the following bullets). Persistent classes are subclasses of %Persistent, which is a direct subclass of %RegisteredObject. The %Persistent class includes the behavior of %RegisteredObject and adds the ability to save objects to disk, reopen them, and so on. For details, see the chapter “Introduction to Persistent Objects” and the chapters that follow it. Serial classes are subclasses of %SerialObject, which is a direct subclass of %RegisteredObject. 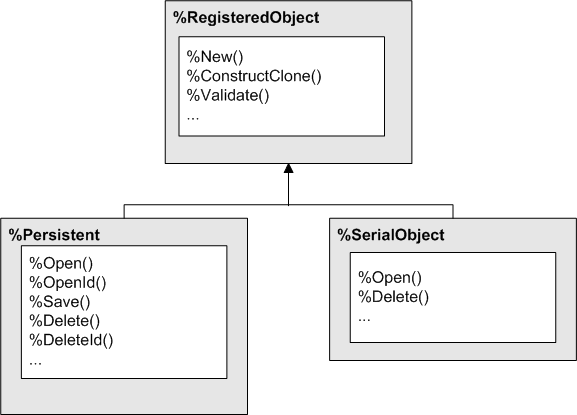 The %SerialObject class includes the behavior of %RegisteredObject and adds the ability to create a string that represents the state of the object, for inclusion as a property within another object (usually either a transient object or a persistent object). The phrase serializing an object refers to the creation of this string. Collection classes and stream classes are object classes with specialized behavior. The phrase data type class refers to any class whose ClassType keyword equals datatype or any subclass of such a class. These classes are not object classes (a data type class cannot define properties, and you cannot create an instance of the class). The purpose of a data type class (more accurately a data type generator class) is to be used as the type of a property of an object class. Parameters  A parameter defines a constant value for use by this class. The value is set at compilation time, in most cases. Methods  InterSystems IRIS supports two types of methods: instance methods and class methods. An instance method is invoked from a specific instance of a class and performs some action related to that instance; this type of method is useful only in object classes. A class method is a method that can be invoked whether or not an instance of its class is in memory; this type of method is called a static method in other languages. Properties  A property contains data for an instance of the class. Properties are useful only in object classes. The following subsection provides more information. Class queries  A class query defines an SQL query that can be used by the class and specifies a class to use as a container for the query. Often (but not necessarily), you define class queries in a persistent class, to perform queries on the stored data for that class. You can, however, define class queries in any class. XData blocks  An XData block is a named unit of data defined within the class, typically for use by a method in the class. These have many possible applications. Projections  A class projection provides a way to extend the behavior of the class compiler. The projection mechanism is used by the Java projections; hence the origin of the term projection. Formally, there are two kinds of properties: attributes and relationships. Typically, you use Atelier to define classes. You can also define classes programmatically using the InterSystems IRIS class definition classes or via an XML class definition file. If you define an SQL table using SQL DDL statements, the system creates a corresponding class definition. When you define a class, one of your earliest design decisions is choosing the class (or classes) which to base your class. If there is only a single superclass, include Extends followed by the superclass name, at the start of the class definition. If there are multiple superclasses, specify them as a comma-separated list, enclosed in parentheses. It is not necessary to specify a superclass when you create a class. It is common to use %RegisteredObject as the superclass even if the class does not represent any kind of object, because doing so gives your class access to many commonly used macros, but you can instead directly include the include files that contain them. %occStatus.inc, which defines macros to work with %Status values. %occMessages.inc, which defines macros to work with messages. For details on the macros defined by these include files, see “Using System-supplied Macros” in Using ObjectScript. If your class does extend %RegisteredObject or any of its subclasses, these macros are available automatically. You can also create your own include files and include them in class definitions as needed. Note that this syntax does not have a leading pound sign (in contrast to the syntax required in a routine). Also, the Include directive is not case-sensitive, so you could use INCLUDE instead, for example. The include file name is case-sensitive. See also the reference section on #Include in Using ObjectScript. For example, the available class keywords include Abstract and Final. For an introduction, see “Compiler Keywords,” later in this chapter. InterSystems IRIS also provides specific keywords for each kind of class member. Keywords represents any parameter keywords. For an introduction to keywords, see “Compiler Keywords,” later in this chapter. For parameter keywords; see “Parameter Keywords” in the Class Definition Reference. These are optional. An object class can include properties. PropName is the name of the property, and Classname is an optional class name (if you omit this, the property is assumed to be of type %String). Keywords represents any property keywords. For an introduction to keywords, see “Compiler Keywords,” later in this chapter. For property keywords; see “Property Keywords” in the Class Definition Reference. These are optional. Depending on the class used by the property, you might also be able to specify property parameters, as shown in the third and fourth variations. Notice that the property parameters, if included, are enclosed in parentheses and precede any property keywords. Also notice that the property keywords, if included, are enclosed in square brackets. You can define two kinds of methods in InterSystems IRIS classes: class methods and instance methods. MethodName is the name of the method and arguments is a comma-separated list of arguments. Classname is an optional class name that represents the type of value (if any) returned by this method. Omit the As Classname part if the method does not return a value. Keywords represents any method keywords. For an introduction to keywords, see “Compiler Keywords,” later in this chapter. For method keywords, see “Method Keywords” in the Class Definition Reference. These are optional. Class and class members follow specific naming conventions. These are detailed in this section. This section describes the rules for class and member names, such as maximum length, allowed characters, and so on. A full class name includes its package name, as described in the next section. Each package name can have up to 189 unique characters. Each class name can have up to 60 unique characters. Each method and property name can have up to 180 unique characters. See the section “Class Member Names” for more details. The full name of each member (including the unqualified member name, the class name, the package name, and any separators) must be 220 characters or fewer. Each name can include Unicode characters. Identifiers preserve case: you must exactly match the case of a name; at the same time, two classes cannot have names that differ only in case. For example, the identifiers “id1” and “ID1” are considered identical for purposes of uniqueness. Identifiers must start with an alphabetic character, though they may contain numeric characters after the first position. Identifiers cannot contain spaces or punctuation characters with the exception of package names which may contain the “.” character. Certain identifiers start with the “%” character; this identifies a system item. For example, many of the methods and packages provided with the InterSystems IRIS library start with the “%” character. For more details on system identifiers, see the appendix “Rules and Guidelines for Identifiers” in the Orientation Guide for Server-Side Programming. Because persistent classes are automatically projected as SQL tables, a class definition must specify a table name that is not an SQL reserved word; if the name of a persistent class is an SQL reserved word, then the class definition must also specify a valid, non-reserved word value for its SQLTableName keyword. Every class member (such as a property or method) must have a name that is unique within its class and with a maximum length of 180 characters. Further, a member of a persistent cannot use an SQL reserved word as its identifier. It can define an alias, however, using the SQLName or SQLFieldName keyword of that member (as appropriate). An InterSystems IRIS class can inherit from already existing classes. If one class inherits from another, the inheriting class is known as a subclass and the class or classes it is derived from are known as superclasses. In addition to a class inheriting methods from its superclasses, the properties inherit additional methods from system property behavior classes and, in the case of a data type attribute, from the data type class. This definition establishes the Employee class as a subclass of the Person class. In addition to its own class parameters, properties, and methods, the Employee class includes all of these elements from the Person class. The leftmost superclass that a subclass extends is known as its primary superclass. A class inherits all the members of its primary superclass, including applicable class keywords, properties, methods, queries, indices, class parameters, and the parameters and keywords of the inherited properties and inherited methods. Except for items marked as Final, the subclass can override (but not delete) the characteristics of its inherited members. See the next section for more details about multiple inheritance. By means of multiple inheritance, a class can inherit its behavior and class type from more than one superclass. To establish multiple inheritance, list multiple superclasses within parentheses. The leftmost superclass is the primary superclass. Specifically, for class X, the values of the class parameter values, properties, and methods are inherited from class A (the first superclass listed), then from class B, and, finally, from class C. X also inherits any class members from B that A has not defined, and any class members from C that neither A nor B has defined. If class B has a class member with the same name as a member already inherited from A, then X uses the value from A; similarly, if C has a member with the same name as one inherited from either A or B, the order of precedence is A, then B, then C.
With right-to-left inheritance, if multiple superclasses have members with the same name, the superclass to the right takes precedence. Even with right-to-left inheritance, the leftmost superclass (sometimes known as the first superclass) is still the primary superclass. This means that the subclass inherits only the class keyword values of its leftmost superclass  there is no override for these. As shown in “Defining a Class: The Basics,” you can include keywords in a class definition or in the definition of a class member. These keywords, also known as class attributes, generally affect the compiler. This section introduces some common keywords and discusses how InterSystems IRIS presents them. /// This sample persistent class represents a person. /// Define a unique index for the SSN property. /// Name of the person. For the class definition, the Extends keyword specifies the superclass (or superclasses) from which this class inherits. Note that the Extends keyword has a different name when you view the class in other ways; see the next section. For the class definition, the SqlTableName keyword determines the name of the associated table, if the default name is not to be used. This keyword is meaningful only for persistent classes, which are described later in this book. For the index definition, the Unique keyword causes InterSystems IRIS to enforce uniqueness on the property on which the index is based (SSN in this example). For the two properties, the Required keyword causes InterSystems IRIS to require non-null values for the properties. PATTERN is not a keyword but instead is a property parameter; notice that PATTERN is enclosed in parentheses, rather than square brackets. Later chapters of this book discuss many additional keywords, but not all of them. Apart from keywords related to storage (which are not generally documented), you can find details on the keywords in the Class Definition Reference. The reference information demonstrates the syntax that applies when you view a class in the usual edit mode. InterSystems IRIS provides a web page called the InterSystems Class Reference, which displays automatically generated reference information for the classes provided by InterSystems, as well as for classes you create. Informally, the Class Reference is known as Documatic, because it is generated by the class %CSP.Documatic. This section introduces the Class Reference and explains how to create your own documentation and how to include HTML markup. This reference information shows the definitions of class members, but not their actual implementations. For example, it shows method signatures but not their internal definitions. It includes links between elements so that you can rapidly follow the logic of the code. There is also a search option. To create documentation to include in the Class Reference, create comments within the class definitions  specifically comments that start with ///. If you precede the class declaration with such comments, the comments are shown at the top of the page for the class. If you precede a given class member with such comments, the comments are shown after the generated information for that class member. Once you compile the class, you can view its generated class documentation the next time you open the Class Reference documentation. If you add no Class Reference comments, items that you add to a class or package appear appropriately in the lists of class or package contents, but without any explanatory text. All Class Reference comments that describe a class or class member must appear in a consecutive block immediately before the declaration of the item that they describe. Note that, by default, the presentation combines the text of all the /// lines and treats the result as single paragraph. You can insert HTML line breaks (<br>). Or you can use HTML formatting (such as <p> and </p>), as discussed in the subsection. The three slashes must begin at the first (left-most) position in the line. No blank lines are allowed within Class Reference comments. No blank lines are allowed between the last line of the Class Reference comments and the declaration for the item that they describe. The length of the Class Reference comment (all lines combined) must be less than the string length limit (which is extremely long). See “String Length Limit” in the Orientation Guide for Server-Side Programming. Class Reference comments allow plain text, plus any standard HTML element and a small number of specialized elements. You can use HTML tags within the comments in a class. With regard to the allowed HTML elements, adhere to as strict an HTML standard as you can, for example XHTML. This ensures that your comments can be interpreted by any browser. In addition to standard HTML, you can use the following tags: CLASS, METHOD, PROPERTY, PARAMETER, QUERY, and EXAMPLE. (As with standard HTML tags, the names of these tags are not case-sensitive.) The most commonly used tags are described here. See the documentation for %CSP.Documatic for details of the others. /// This uses the <CLASS>MyApp.MyClass</CLASS> class. /// This is identical to the <METHOD>Unique</METHOD> method. /// This uses the value of the <PROPERTY>State</PROPERTY> property. /// of the value specified by <VAR>x</VAR>. InterSystems IRIS class definitions are compiled into application routines by the class compiler. Classes cannot be used in an application before they are compiled. The class compiler differs from the compilers available with other programming languages, such Java, in two significant ways: first, the results of compilation are placed into a shared repository (database), not a file system. Second, it automatically provides support for persistent classes. It generates a list of dependencies  classes that must be compiled first. Depending on the compile options used, any dependencies that have been modified since last being compiled will also be compiled. It resolves inheritance  it determines which methods, properties, and other class members are inherited from superclasses. It stores this inheritance information into the class dictionary for later reference. For persistent and serial classes, it determines the storage structure needed to store objects in the database and creates the necessary runtime information needed for the SQL representation of the class. It executes any method generators defined (or inherited) by the class. It creates one or more routines that contain the runtime code for the class. The class compiler groups methods according to language (ObjectScript and Basic) and generates separate routines, each containing methods of one language or the other. It compiles all of the generated routines into executable code. It creates a class descriptor. This is a special data structure (stored as a routine) that contains all the runtime dispatch information needed to support a class (names of properties, locations of methods, and so on). When you compile a class, the system also recompiles other classes if the class that you are compiling contains information about dependencies. For example, the system compiles any subclasses of the class. On some occasions, you may need to control the order in which the classes are compiled. To do so, use the System, DependsOn, and CompileAfter keywords. For details, see the Class Definition Reference. class is either a single class name (as in the example), a comma-separated list of class names, or a multidimensional array of class names. (If it is a multidimensional array, be sure to pass this argument by reference.) It can also include wildcards. included is a multidimensional array of the names of the classes that will be compiled when class is compiled. qspec is a string of compiler flags and qualifiers. See the next subsection. If you omit this, the method considers the current compiler flags and qualifiers. b - Include sub classes. c - Compile. Compile the class definition(s) after loading. d - Display. This flag is set by default. i - Validate XML export format against schema on Load. generated routines will be kept. l - Lock classes while compiling. This flag is set by default. p - Percent. Include classes with names of the form %*. r - Recursive. Compile all the classes that are dependency predecessors. s - Process system messages or application messages. u - Update only. Skip compilation of classes that are already up-to-date. they either reference to or are referenced by the current class in SQL usage. You may change the default flags with the SetFlags(flags,system) classmethod. Description: Validate imported XML files against the schema definition. Description: Skip classes or expanded classes that are up-to-date. When compiling a class that contains a bitmap index, the class compiler generates a bitmap extent index if no bitmap extent index is defined for that class. Special care is required when adding a bitmap index to a class on a production system. For more information, see the section “Generating a Bitmap Extent Index” in the “Defining and Building Indices” chapter of SQL Optimization Guide. If the compiler is called while an instance of the class being compiled is open, there is no error. The already open instance continues to use its existing code. If another instance is opened after compilation, it uses the newly compiled code. You might want to make some of your classes deployed before you send them to customers; this process hides the source code. For an alternative approach, see the article Adding Compiled Code to Customer Databases. You can open the class definition in Atelier, but it is read-only. You cannot export or compile a deployed class, but you can compile its subclasses (if they are not deployed).